57 years ago something so strange happened it has inspired books, movies and conspiracy theories that include everything from soviet death rays, to yeti type scenarios, to UFO stories. All that is known for sure is that a group of nine people lost their lives in an area known as Holatchahl or Dead Mountain in Russia. 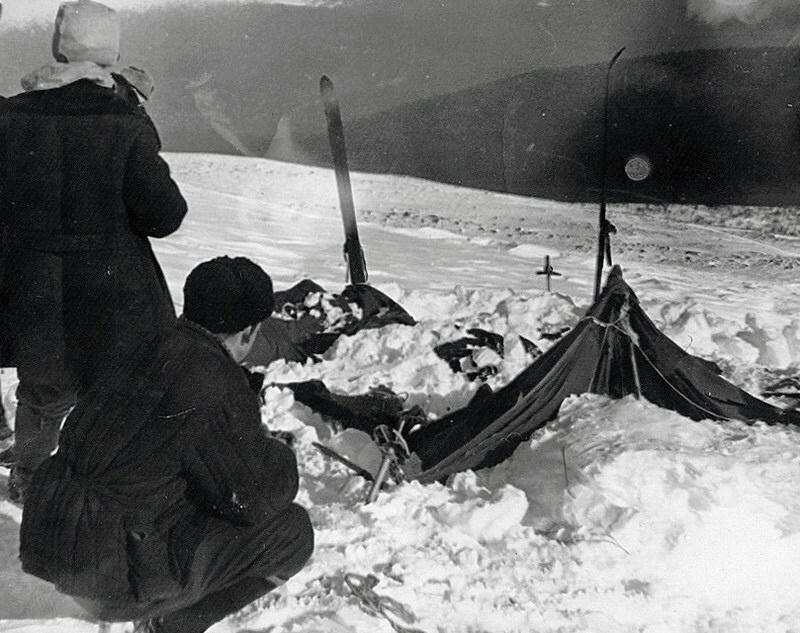 It was dubbed the Dyatlov Pass Incident, named after Igor Dyatlov, the man who was the leader of the group who wanted nothing more than to get a higher hiking certification and have an adventure. 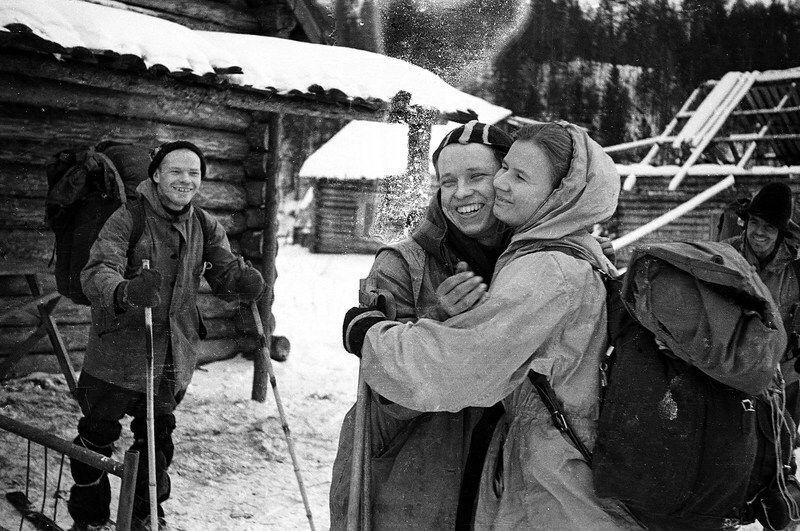 In January of 1959 eight men and two women some of whom were students and some who were graduates of the Ural Polytechnical Institute in Sverdlovsk (now called Yekaterinburg), traveled by train to enjoy a strenuous cross country skiing expedition to earn their Grade III hiking certification. In order to obtain this coveted distinction, they had to cover a minimum of 186 miles, (1/3 of which had to be challenging terrain), be out a minimum of 16 days (8 of those days had to be in uninhabited regions) and at least 6 nights in a tent. Once they achieved these requirements, they would be considered Masters of Sport and allowed to teach. The group that consisted of engineers, construction specialists, students and a WWII veteran left with high expectations and no doubt in their minds they would achieve their goal. Sadly, none of them would obtain that on this trip and nine would die under mysterious circumstances. The group had several days journey from their town to their starting point which was an adventure in itself. During this time Yuri Yudin was having a flair up of chronic back pain that he suffered from, each different mode of transportation and each night spent in a new town making it worse. During the last leg of the trip, before they were no longer in civilization, he managed to make the strenuous 3 hour ride from Vizhai to Sector 41, the last inhabited outpost before the Otorten range, his pain kicked into overdrive almost making him quit. Only the fact that Sector 41 was a geological settlement made him stay quiet. As a geology student he was determined to see what he might find in the deserted buildings. After spending the night sleeping on a hard floor, Yuri could not move the next morning and the decision was made for him to finally turn back so he would not be a burden on the rest of the group. On January 28th, Yuri hugged his friends while they took some last group photos, clueless that he would never see any of them alive again. In later years, in interviews, he would say “If I had a chance to ask God just one question, it would be, ‘What really happened to my friends that night?’ and he is not the only one wanting the answer to that question. After saying goodbye to Yuri, the group unknowingly set off for their date with death and spent the next few days traversing the countryside, taking photographs and detailing campfire discussions in their trip diary. It is those photographs and diary that tell us they set out for a very difficult leg of the trip on the morning of February 1st. There is nothing else to tell us what really happened, even the condition and location of the bodies when they were found raised more questions than gave answers. The group was supposed to arrive back in Vizhai on February 13 and send a telegram back to a comrade that they had returned safely. Trips like this can sometimes go a little longer than planned, so family members let few days past before starting to become alarmed that none of them had been heard from. On February 17, the university sent a telegram to Vizhai to find out if the hikers had returned and the families requested a search plane. 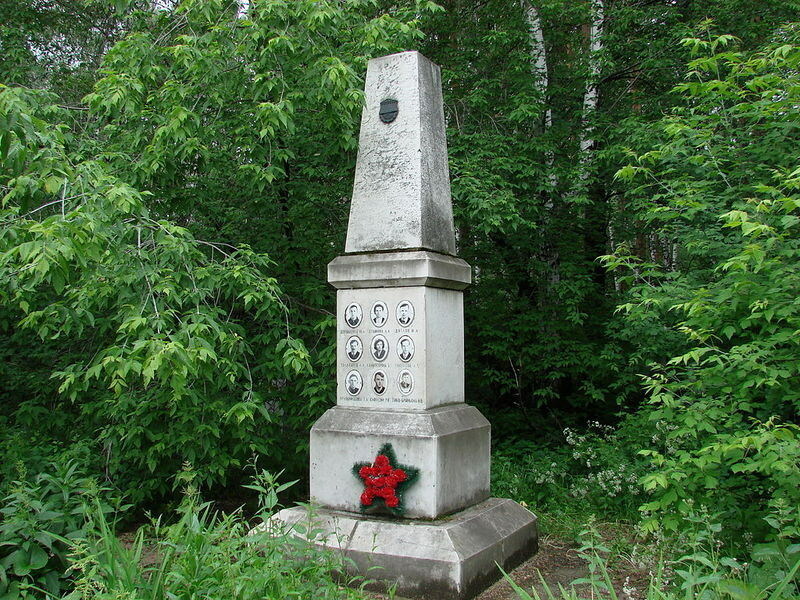 When the answer to the telegram, “The Dyatlov group did not return”, was received, Col. Georgy Ortyukov attempted to assemble a formal search party, but they could not find the groups approved route. When Yuri left his friends at Sector 41, he went to visit his family so he did not return to school until well after the group should have been back and even then he failed to tell them that the group had been running 3 days behind their schedule. Their advisor and only other person besides Yuri who knew their mapped route was surprised when he returned and they were not back. Because of these delays and lack of information, the official search did not start until February 20. That same day, a criminal investigation was ordered. From that point on it was a search party including schoolmates, the government and local Mansi tribesmen. The search team spent days recreating the route and trying finding remnants of the spots they camped each evening. On February 25 a pilot spotted ski tracks and instructed the search party to alter its route. The team discovered the tracks and evidence of one of the group’s campsites. On February 27th they made it to an abandoned encampment on the eastern slope of Dead Mountain listed as 1079 (that’s how many meters high the location was on the mountain). 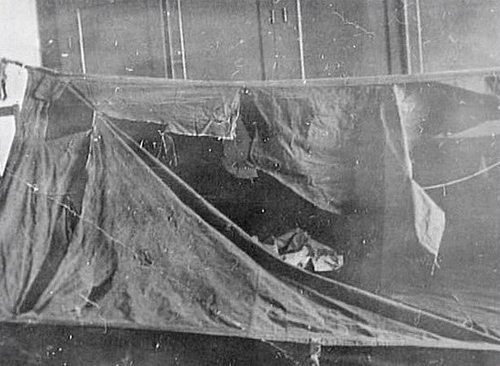 One of the searchers, Mikhail Sharavin, said they discovered that the tent was half torn down and covered with snow but that he used an ice ax laying in the snow in front of the tent to rip it open. It was empty of people, but all of the group’s belongings, food and shoes had been left behind neat and orderly, as if they had just been laid out. Sharavin and his fellow searcher, Boris Slobtsov, collected a jacket, camera, flask of medicinal alcohol, a pair of skis, a Chinese torch and the ice ax to take back to base camp to make a new search plan. When the search resumes the next day, many yards from the tent they find nine sets of footprints, some of them indicating the person that made them was not wearing shoes. Sharavin was looking for a new bigger area to set up basecamp when he came across an area with burned cedar partly buried in the snow and what appeared to be a fire pit. A little ways from the pit they notice a knee sticking out of the snow. After alerting the others, an excavation revealed the bodies of two men lying side by side. One is wearing nothing but his shirt and a pair of swimming trunks under his long underwear that only contains the material for the right leg. The other man was wearing an undershirt, shirt, long underwear, briefs and socks. Even though this clothing is on their bodies, it is completely shredded and their hands a bloody mess. The searchers noted that a cedar tree in the area seemed to have had the branches snapped off to a height of almost 15 feet. Testing later proved the two had tried to climb the tree, leaving their skin behind in the bark. The search team puzzled over the fact that there were no animal tracks nearby but something had removed the mouth and eyes of the man lying on his back. So far there were no clues as to what had scared these men enough to abandon camp with no warm clothes or shoes in frigid temperatures, winds of 40 mph, and no light because the moon would not rise for six hours after their flight from the tent which took them a mile away. A few hundred yards away, the team leader, Igor Dyatlov, was found underneath several inches of snow, lying on his back wearing a shirt, sweater, fur vest, ski pants, and mismatched socks griping a tree branch with ungloved hands and apparently protecting his head from something unknown. The watch still on his wrist has stopped at 5:31. A female member was found even further away, dressed in a hat, ski jacket, pants, and socks with traces of blood on her face. On March 5th, about 1,000 yards from the tent site, midway between where the last two members had been found, another team member was found wearing a cap, shirt, sweater, pants, and several pairs of socks. He was lying face down in the snow. His head is discolored, indicating trauma. 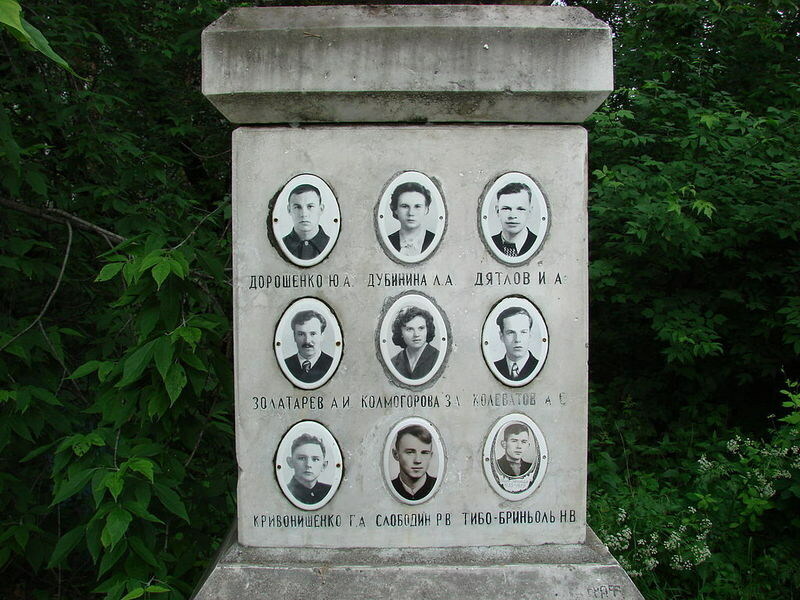 Examinations would later show that all 5 of these team members had died of hypothermia. Three of the bodies were found in a line from the tent to the fire pit area, but they all appeared to be hiking back towards the tent they had all fled from earlier. Testing would later prove that someone had cut the tent from the inside in three different places to escape. 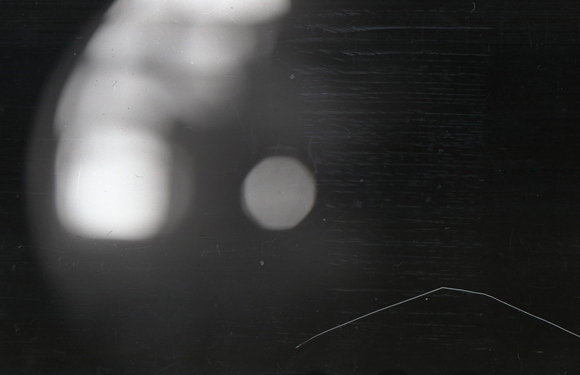 The diary and undeveloped film did nothing but add to the mystery. The last entry in the journal only detailed the day before their deaths and the morning of while they were still at camp. There was not much in either to help them figure out what had gone on. After the discovery of the 5th body, it was decided to halt the search to wait for some of the snowpack to melt in the spring thaw. It took two more months for the other members remains to be found about 225 feet from the fire pit area, opposite the tent site. On May 3rd they started finding an odd trail of clothes near the creek area they had been excavating. The next evening they found a body they could tell was male wearing a gray sweater and oddly enough two wrist watches, but the decomposition was so bad they could not tell who it was. As they kept digging they uncovered three more bodies. The female was wearing a cap, undershirt, sweaters, pants and two socks on one foot. The other foot was wrapped in a sweater. The two men were found in an embrace indicating an attempt at getting warm. These four were found fully dressed in a ravine 24 feet deep and three of them had suffered severe internal injuries. One had extreme fractures to the head, one had five fractured ribs, and one nine fractured ribs. The medical examiner was disturbed to find that the female was missing her tongue. The investigation later revealed that these four were wearing clothing from other victims, which later explained why the first two bodies found were not wearing much as it was surmised the 4 had taken the clothes to keep warm and use in a hole they had dug for shelter. Unfortunately, they could not have used this shelter for long since they were the last four to die. The ongoing investigation surmised that the team had made it to that slope on February 1st around 3 pm, ate a dinner of cold biscuits and ham around 9 pm and then settled down for the night. Based on stomach contents, pathologists concluded that the deaths started to occur between 2 to 4 hours later. Sometime before midnight the group had been frightened by an unknown event and ripped through the fabric of the tent in a state of panic. The shoeless tracks proved they had scattered in all directions but some of them had joined up in the wooded area where they were successful in making a fire, everything after that is speculation, but at some point 2 tried to climb the tree and later died, 3 tried returning to the tent and died, and four made their way to a ravine, supposedly fell about 24 feet and died a little later of resulting injuries. It took 8 hours for all 9 to die. At the funerals, family members noted that the skin of the victims was a strange orange color or extremely dark and they had grey or white hair and some of the clothing they retrieved was so radioactive that it exceeded the standards for someone working with radioactive substances. The leader of the group, Igor Dyatlov was so unrecognizable, he could only be identified by the gap in his teeth. Later investigations into these strange circumstances revealed that the strange skin color was a result of the elements and that the radiation traces in the clothing was not as dire as first reported and that Lyuda’s missing tongue was due to the fact that that she had been lying in melted snow and water had decomposed it. There has been absolutely no evidence to point to a conclusive cause of events which leads to theories with no basis. A run in with the local Mansi tribesmen, known for their brutality? The Mansi were peaceful people who were known to shelter lost hikers. In fact, another group of hikers had been the recipients of Mansi hospitality just a few days before the incident. A group of hikers camped out 32 miles south of the skiers reported strange orange spheres in the northern sky and in the next month and a half other residents in the area reported the same thing. An investigator claimed in a 1990 interview “I suspected at the time, and am almost sure now, that these bright flying spheres had a direct connection to the group’s death” but that he had been ordered to close the class and classify the findings as secret. Does the last photo taken by the group lend any credence to the alien theory? Other suppositions included Soviet missile testing, a bear attack, mythic artic dwarves, some kind of concussive explosion, poison by moonshine causing instant blindness and an avalanche. After the close of the investigation, the authorities barred access to pass to Holatchahl and the surrounding area for three years. The lead investigator, Lev Ivanov, wrote in his final report that the hikers had died as a result of “an unknown compelling force”. The one person who lived because he was in too much pain to continue later told people that when he was asked to identify the belongings, there were items that he could not account for including scraps of clothing that looked like a soldier’s uniform and skis that did not belong to any of the hikers. This led him to believe the hikers had unwittingly stumbled onto a secret military test and had been killed for it. The only thing that is certain is that when you view the photos taken of the skiers remains nothing is certain. There are just too many odd findings to point to any one thing, although at a 2008 conference attended by the six surviving search party members and 31 technical experts, it was concluded “that their deaths were likely the unintended result of a secret military test”. A more recent investigation by Donnie Eichar, a man who diligently tried to recreate the hikers trip to the best of his ability, surmises they were the victim of an infrasound phenomenon as a result of a Karman vortex. 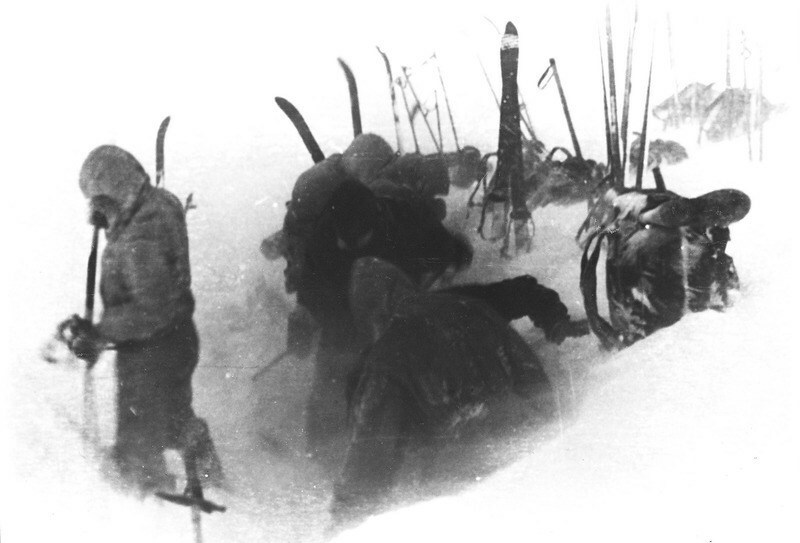 I HIGHLY recommend Donnie’s book, Dead Mountain: The true story of the Dyatlov Pass Incident. 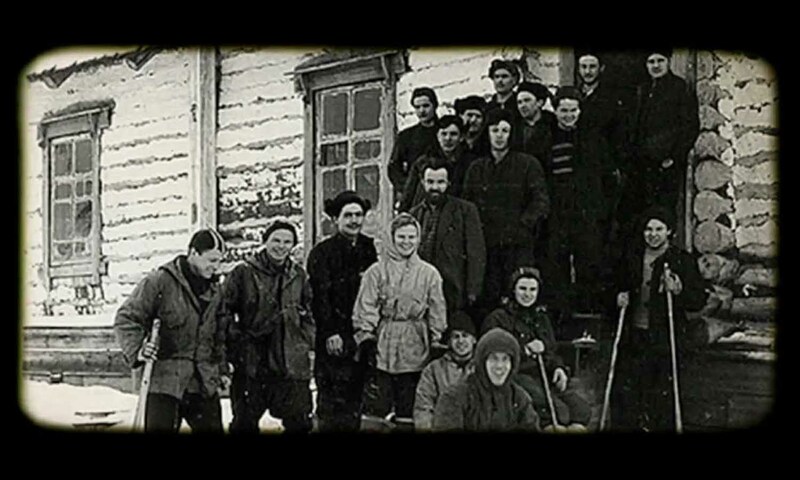 It is well written and simultaneously tells the story of the original hiking team, the rescue team, and Donnie’s own expedition through the pass after interviewing living family members and Yuri Yudin to try to find the truth. While an army of alien military yeti would sell a lot more books and movies (and could you imagine the costumes at Dragon Con! ), the infrasound theory/Kármán vortex, at least to me, seems to make the most sense and since it had not been deemed a scientific fact at the time of the incident, it would never have been considered a possibility. Could it be something as “simple” as a tragic event caused by elemental factors that resulted in a “perfect storm” simply because of where the hikers pitched their tent in relation to the dome of the mountain peak? One thing is for certain, 57 years later the unprovable theories are still being talked about which means that these young people have not been forgotten. Yuri Doroshenko “Doroshenko”: Age 21 Studied radio engineering. Lyudmila Dubinina “Lyuda”: Age 20 The youngest of the Dyatlov group, and one of two women. A student in construction and economics. Igor Dyatlov “Igor”: Age 23 The leader of the Dyatlov hiking group and engineering student. Zinaida Kolmogorova “Zina”: Age 22 One of two women in the group. Studied radio engineering. Alexander Zolotaryov “Sasha”: Age 38 WWII vet and engineering student. 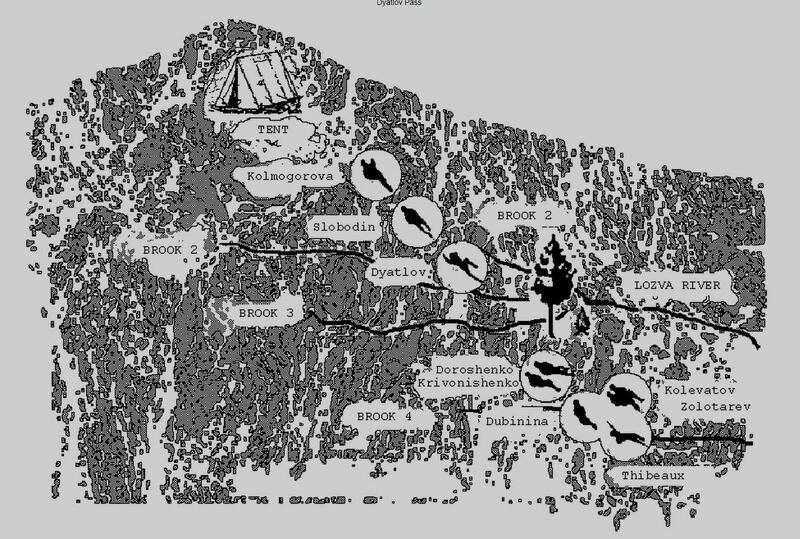 If you look up dyatlov pass travel, all the experiences mentioned in the journals,are to be found there.Fireballs ,voices,ghost shapes.The pass is now an official paranormal site. Why Do You Wake Up at the Same Time?